A study published in the May 2015 issue of JOSPT investigated whether BPPV is associated with an increased risk of falls that result in fractures. Researchers in Taiwan studied 3796 individuals who had just been diagnosed with dizziness from BPPV and compared them to 15 184 people without a history of dizziness. The researchers evaluated the risk of fractures in both groups by following these individuals for up to 12 years. The data indicated that overall, those with BPPV were at a higher risk of fractures during the 12-year period after their diagnosis. The added risk of fractures was particularly seen for the spine, ribs, and pelvis region. When looking at age groups more closely, the diagnosis of BPPV was especially related to a greater risk of fractures for both men and women over the age of 65. Although we knew that dizziness increased the risk of falling, this study shows that BPPV-related dizziness is also associated with increased risk of fractures from those falls. Fractures of the spine, ribs, and pelvis region limit movement and activity, which increases the risk of other health issues. If you feel dizzy, you should let your health care provider know. 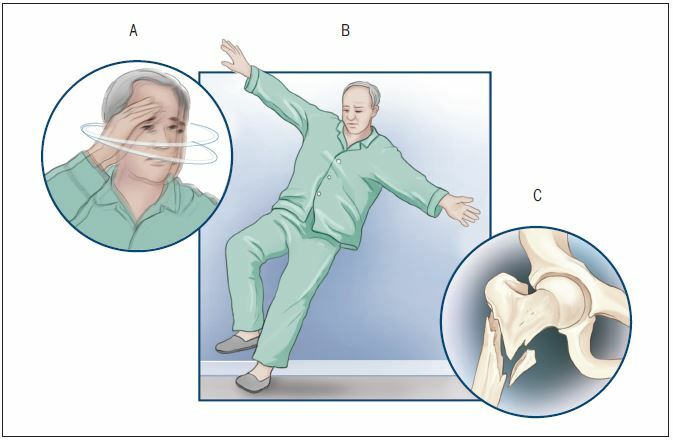 Proper evaluation is very important, ﬁrst to determine the cause of the dizziness. Many causes are treatable, including BPPV. Based on careful evaluation, the proper treatment for dizziness could decrease the risks of falling and breaking bones. For more information on the treatment of dizziness, contact your physical therapist specializing in musculoskeletal disorders and vestibular rehabilitation. Copyright © 2015 Journal of Orthopaedic & Sports Physical Therapy®. For this and more topics, visit JOSPT Perspectives for Patients online at http://www.jospt.org.